In The Confidence Code: The Science and Art of Self-Assurance—What Women Should Know, ABC news reporter Claire Shipman and BBC anchor Katty Kay write that women suffer from a lack of confidence to such an extent that it undermines their success in the workplace. Similarly, a lack of confidence among women writing dissertations can cause them to get stuck often and even derail the dissertation process. To build confidence, women not only need to learn helpful strategies, but they also need to take note of where they allow a lack of self-confidence to sabotage themselves. Some dissertation coaching clients allow their lack of confidence to potentially damage their critical relationship with their advisor. A lack of confidence can allow a dissertation writer to let months go by without reaching out to her advisor. Years ago, during a check-up with my internist, she asked about my dissertation. Before I could answer, she related how fearful she had been when she was writing a thesis during her master’s program in science that at one point, she said that she waited until her advisor had left his office and then, to avoid talking with him, slipped her writing beneath the door and then waited weeks before she had the courage to ask if he had comments for her. In an interview with Charlie Rose, Claire Shipman and Katty Kay discuss the research on which they based their book. From the data obtained from neuroscientists, they learned that “confidence is somewhere between 25 to 50 percent genetic.” However, perfectionism, which the authors say is largely a female issue, most likely comes from nurture. Perfectionism can extend throughout a woman’s life, undercutting her confidence and success. Because women for most of their lives work so hard to be perfect, whether it is in writing a paper or in planning a vacation, they waste time and increase their lack of confidence. “We spend too much time ruminating, stewing, thinking over our actions,” Shipman says. The authors argue that many women do not know how to fail and do not know how to use failure as part of the process of getting better at something. Women remember failure longer than men, but not as an opportunity for learning. They often return to “stew” over the episode which, they think, shows their inadequacies and gives evidence of how easily they could fail again. To increase your confidence, it is important to put yourself in challenging situations and stick with the hard work and frustration of learning how to do the work. A dissertation client who has had issues with intellectual self-confidence for most of her academic life now appreciates the strength that comes from struggling and from tolerating academic frustration. She thinks that had she been taught differently in her early years of school, she might have adopted a different mindset toward learning and have had more self-confidence. She says that in Japanese schools, the main point isn’t that a student gets the right answer to a math problem, but rather that the student continues to struggle and learns to tolerate the frustration that goes with the struggle. Psychologists tell us the consequences of an American education which downgrades the merit of intellectual struggle become clearer during the high school experience when girls increasingly doubt their ability to think through thorny problems or texts. My dissertation coaching client is gradually learning how to tolerate the frustration that goes with intellectual struggle. She said that when she had to do statistics and math in the past, she was afraid to show when she was stuck or had questions, but the dissertation has changed that. Now as she writes her dissertation, she says that she uses various strategies that will help her stick with the task, even when it feels frustrating. She has found it helps to recognize what she has done right and to talk herself through those specific, successful steps. She says that she then feels more competent and that she recognizes that she knows enough to continue the work. Had she been taught as a child that tolerating frustration was the way to academic success, she might have avoided the tongue-lashing she says she received from a department head in graduate school when she made a self-deprecating remark about her abilities. He quickly let her know that such a remark was not acceptable. Not only did he want no excuses, but he also wanted her to show that she could tolerate frustration during the learning process. Recently another client reminded me of something I had told her a few weeks ago. She said it had helped her when I said that “writing a dissertation is not supposed to be easy.” Of course, that statement is not original with me, but I’m glad that my passing it along helped my client. Over the years I have also reminded myself that writing is not supposed to be easy. Any thoughts? How are you testing your confidence? How will I know if my idea is any good? In the Mad Men episode “The Strategy” (5/18/2014), advertising copy chief Peggy Olson is angry and demoralized because the more experienced, assured Don Draper has suggested possible changes to her pitch for an ad. Panicky, she questions her own idea. She hates the uncertainty of not knowing whether her idea is really good or crap. “How am I supposed to know?” she asks. Peggy’s lack of confidence in her own opinion illustrates one of the series’ major themes, that is, gender issues in the 1960s. Peggy, unlike Don, is immobilized by her uncertainty and lack of confidence. And she lacks the strategies, past successes, and self-confidence that would help her make a choice and move on. That an idea may be good enough does not fit with Peggy’s perfectionism. Don suggests that if it’s almost done and it’s good, then maybe you should accept your idea, but Peggy does not want “good enough”—she wants perfect. Peggy has risen in the company from secretary to copy chief. She is uncomfortable in her own skin. And, it is with good reason. She is routinely reminded that being a woman comes with many handicaps in business. Don’s first impulse is to show his sense of humor and his ease with the situation. He says, “Whenever I’m really unsure about an idea, first I abuse the people whose help I need” (Peggy smiles). Then, Don says, “I take a nap.” He’s telling her to step back and disengage a bit. What Peggy needs are strategies that will help her problem solve. Grabbing the faithful yellow legal pad, Don says that the way he thinks is to “start at the beginning to see if I wind up at the same place again.” The point is to go at your problem from a different angle, and don’t be invested in only one idea. His process makes sense. When in doubt, slow everything down and step away—take a nap (or go for a walk or pull weeds) and then look at the issue from a different perspective. Don isn’t afraid of reframing the problem, and he doesn’t think there is only one possible answer for a problem. ABC News reporter Claire Shipman and BBC anchor Katty Kay argue in their 2014 book The Confidence Code that women’s lack of self-confidence and need for perfectionism continue to undermine their success. Are women in 2014 more susceptible to a lack of confidence than men? If so, why? What role does indecision and perfectionism play in our writing lives? What do you think… about Mad Men and Peggy? And, as a writer, how do you decide if your idea is any good? 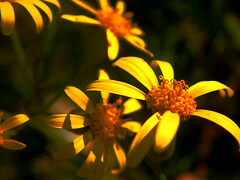 I find it interesting how determined most of us are to derail ourselves in big and small ways. We can put a lot of effort into avoiding focusing on a dissertation. How about you? Perhaps you have developed a terrific plan and writing routine, just as has one of my dissertation clients. If not, there’s hope. Take some cues from my client who credits his plan for his increased productivity. As he rides the bus to his day job, he plans what work he’ll do on his dissertation in his first session of the day. Once he’s close to his office, he finds a quiet place to work, and for about 45 minutes, he follows his plan and either writes or edits a section of his dissertation. Then he goes on to his usual place of work and puts in a full day. At day’s end, after he’s returned home and has had dinner, he puts in about 90 minutes in his second writing session. He says that the twice-a-day schedule allows him to be more productive than if he worked a longer session once a day. The writing is never far from his mind. He finds that he looks forward to returning to the work at the next session. And even over holidays, he tries to adhere somewhat to his plan just to keep his head in the material. If you haven’t put a plan into action, first turn off the internet, television, and whatever else is distracting you. Believe me, I know that finding the will to write is not easy, but you can do it. It starts with taking control and laying down the basics for yourself. 1. When will you write? What day and what time? 2. Where will you write? 3. What will you write in that first session? 4. And when does the first session end? Nothing much will happen until you have a given yourself specific directions. What is your plan? What’s your own twist that makes the plan work for you? Happy end of November to you. December looks like a good month for writing, don’t you think? Hate to Edit? Why Make Big Problems Out of Little Problems? When my two kids were little, they loved the book Big Dog, Little Dog, A Bedtime Story. 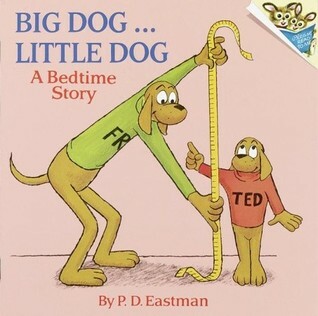 In the book, Fred and Ted, two friends, who are both dogs, deal with all sorts of small dilemmas. Fred is tall, and Ted is short. Fred’s bed is too short for him. What to do? Change beds with Ted. And so the book goes. The two friends problem-solve one problem after another. One of my dissertation coaching clients has been resisting line-editing a chapter. Line editing is tedious, no doubt about it. My client has this going for him—he has a morning routine. He’s set aside time for working on his dissertation before he does anything else. He has his morning coffee, but he doesn’t open his email. And so it would seem that he’s not suffering from what Roy Baumeister and John Tierney in the book Willpower call “decision fatigue.” He isn’t worn down by his day. Yet, instead of diving into the line-editing, the task he set for himself, he addresses easier tasks and never gets to the hard work of editing. My client can point to other work he’s taken care of during the morning time he has set aside for his dissertation, but not what he had planned to do. He says he’s stubborn. He may be, but what I know for sure is that he’s a stickler. In both his day job and in his after-work activities, he is detail-oriented. He’s a stickler for doing things right because he has to be. I know he can do the work. What is holding him back? What is he afraid of? That he might make a mistake? That’s a given, right? Editing is like sweeping sand. It’s unlikely he will catch every grain, but it is time to stop the delay. And you know what? That approach has worked for my coaching client in the past. On occasion, he has told me that when he strenuously resisted work, he used a timer to help him stick with a task for a short, designated amount of time. That strategy will work for him again. Similarly, he can once again monitor himself. He can be accountable to himself. And I’ll be sure to hold him accountable, too. Just as the moral for Big Dog, Little Dog, A Bedtime Story asks the question “Why make big problems out of little problems?” the same question can be asked of my client about his resistance to line-editing his dissertation chapter. If you hate to edit, edit a little bit at a time. Do what you can bear to do, but do something! Slowly, but surely you’ll get it done. Why make big problems out of little problems? I would love to hear from you. How do you deal with tedious writing tasks? Shifting into Summer Writing — Where Will You Write? And What about the Kids? Like Christmas/New Year’s/Spring Break, summer makes all things seem possible, especially if your goal is to produce as much text as you can on your dissertation or other writing projects. For many of my clients who live in the Northern Hemisphere, this is the time of year when they are shifting into summer schedule with a plan to focus on writing. Perhaps you, too, are almost into summer mode with a plan to write. If so, will you have the company of your kids? And what about the kids? How do they fit with your writing plans? If you have most of the responsibility for their care, you have probably long been aware that the demands of childcare make successful completion of your degree more difficult, and perhaps less likely. I’ve maintained that if you want to get any writing done, you need a door between you and your kids. Do You Need More than a Door? And so I’m hearing from her, and from many clients, plans for day camp and away-camp for kids. Should you think about camp, too … for yourself? A place where you would have control over your time and fewer distractions? Where it would be quiet and you could write? Day camp for you could be a library or coffee shop. Or you could rent writing space for the summer. Renting a space would be perfect. And, yes, I have had dissertation clients who rent writing space. Novelist J. Courtney Sullivan rents space at the Brooklyn Writers Space. She says that it is “almost like library carrels — you don’t have a set desk, you sit wherever there’s an opening and it’s incredibly quiet. It’s totally silent.” Sounds great doesn’t it? No interruptions from little ones, no unexpected phone calls. 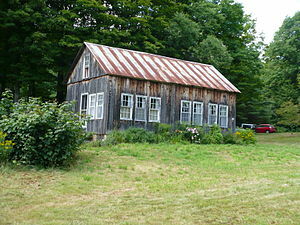 In fact, Sullivan says that the writers space is so quiet that “you would not want to be the person whose phone starts ringing.” Or if you want a week away to a quiet place in order to get a good start on your writing, consider renting a cabin with writer friends. Your time would be your own. No kids, no spouses. Something I haven’t done but I think would be a terrific idea is to house-sit for someone. Again, no kids, no spouses (I’m assuming the kids have grandparents or other relatives who can help out with the childcare if your spouse isn’t up to it). If your only obligation is to water the plants and feed the cat, you will have a perfect opportunity to ease into your writing and produce text. One last description of a writer’s retreat may sound as if it couldn’t be based on reality, but I swear that it is. A client is working toward her PhD at a major research university, and she has the great good fortune to have a professor who loans her vacation lake house to a graduate student for a 2- or 3-day writer’s retreat. As long as the professor isn’t using it, she’s happy for a graduate student to have access to it. At no cost. My client has used the professor’s house several times. As you might expect, during her retreat she has not only made headway on her work, but she has also usually unraveled a particularly thorny writing problem. More than once my client and I have discussed how she can hold onto her writer’s-retreat state-of-mind after returning home. One of her successful strategies for re-creating that state-of-mind has been to go to a quiet library. What can you do now to better ensure that this summer will be a great season of writing for you? What will you do about your writing environment? And what about the kids? I would love to hear your plans for a successful shift into summer writing. Walking up to the United States customs agent in an airport after a trip out of the country always makes me feel uneasy. Will there be something wrong? Where should I look as the agent flips through my passport? Whew. I’ve passed muster, but I’m also curiously touched. I know there’s nothing personal in the greeting. It’s predictable that the customs agent welcomes the traveler, but I always feel a bit of emotion rising in my chest. I guess I belong here after all. And the relieved and happy Cobb/DiCaprio crosses the boundary into the U.S. He’s home. Of course, he had reason to worry. He could have been denied entrance. A customs agent in the role of gatekeeper reminds me of how often we can doubt that we belong in a community or in a situation which formerly had seemed or claimed to be our home. The notion of home, returning home, and feeling at home in various situations goes beyond familiar settings, sentimental snapshots, or an address on a customs form. Most ABD’s come to a graduate program feeling at home, challenged, but nevertheless sure that this is where they will find the opportunity, the collegiality, and the inspiration that will bring out the best in them. Even if they had felt completely at home as they took classes or as they wrote papers for classes or perhaps even acting as teaching assistants, once the students have moved past their course work or into the dissertation process, they are too often thrown by the process and feel out-of-place as they try to finish their dissertations and earn their degrees. As I coach writers, I am struck by how frequently brilliant, capable ABD’s become stuck and start to feel incompetent and unworthy. ABD’s know what they’re supposed to do. They’re supposed to make goals and meet deadlines and just write. But for many ABD’s, deadlines have become counterproductive. The pressure and the isolation of trying to grind out text somehow raise such self-doubt that they start to question whether they belong in this doctoral program. Some compare themselves unfavorably with others who are further along in the dissertation process. They feel such regret and, worse, they feel such shame for time wasted during the doctoral program that they’re almost paralyzed. Do they have what it takes to finish this degree? The familiar situations and professors no longer seem reassuring, but rather seem to raise barriers to the extent that ABD’s start to see themselves as frauds or imposters. If this sounds like your situation, you could take a cue from some graduate students who have gone through periods of self-doubt and shame and have rewritten the process to make it work for them. Instead of focusing on the product or on finishing, focus on the present moment. Determine the block of time that you are setting aside each morning for yourself and decide what your choices will be during that time. You can decide that you will write and that’s all, or you could have a variety of tasks to choose from, as long as you put in the time. What is important is that you step back from the process and lower the stakes from producing something brilliant and perfect to doing something. The writing process will be one of ebb and flow. Some days, the writing will be crappy, and other days you might think the work you did wasn’t half bad. What is important is that you show up each day at the time you have carved out for yourself and write. Do something. And it will be good enough. Is there a writer who isn’t lured and waylaid by the distractions of the internet and email? Is there a writer who hasn’t written about those same distractions? How about you? How well did you do today? Did you stay on task and reach your writing goal for the day? Or did procrastination and Facebook win out? My dissertation coaching clients are trying to use the Nothing Alternative—that is, during the time they’ve set aside to write, they write… or do nothing. They tell me, though, that the Nothing Alternative strains their willpower. They do better if they remove the temptation of the internet. Several clients are using SelfControl software or the Anti-Social app to lock them out of the internet. This week I heard about another program—Freedom. The client who told me about Freedom said that even though he has used it successfully, he frequently has to talk himself into setting it up. And why would he resist a successful strategy? Because once he has it up and running, he will have robbed himself of his excuses not to write. It’s write or do nothing. My client is in good company. Writer Nora Ephron says that every morning she spends several hours “failing to make a transition” from reading the morning newspaper to working and being productive. To help to fight her urge to procrastinate, she sets up Freedom on her computer to lock out the internet. Writing is hard work, and most of us yearn for distraction, especially something as mindless as the internet and email. Lock it all up—give yourself some freedom!